As a Pulitzer-Prize-winning roving national correspondent for the Los Angeles Times, Barry Siegel had the enviable assignment of seeking out virtually any story that provoked his curiosity. This superb collection draws from ten years of his freewheeling mandate. Wonderfully varied in setting, scope, characters, and subject matter, each piece is both an individual triumph and a penetrating view of the true world we live in—a world cast in "shades of gray" ambiguity. Story after dramatic human story forces us to confront the dilemmas of our daily lives. Here is our subterranean reality: A place where people resolutely wrestle with the need to make choices and take action in situations that offer no clearly right answers. "Siegel's talent for thoughtful and responsible reportage, first evidenced in A Death in White Bear Lake (1990), finds a perfect showcase in this collection of pieces (most first published in The Los Angeles Times) on how ordinary Americans grapple with ethical ambiguity in courtrooms, scientific laboratories, doctors' offices and everyday life. Any one of the agonizing conflicts described in Siegel's perceptive and wide-ranging reports would provide enough material for a short story, or even a novel. Put together, his tales...overwhelm with a sense of hundreds of ordinary Americans agonizing over how to do what's right, as well as with a realization of the often utter impossibility of doing so. The best possible combination of journalism and storytelling, matching weighty themes with real-life, three-dimensional Americans to wrestle with them. Not what you read in the headlines—this is captivating news." "Journalism has been described as the literary equivalent of signing one's name on the surface of a lake. Occasionally, however, journalists like Joan Didion and Tom Wolfe come along who defy this dictum, whose work transcends traditional standards of reportage and, when gathered in book form, earns for its creators a literary cachet as lasting as that of any author. Barry Siegel is in that league...Shades of Gray should give pause to those who claim print journalism is dead. Whether investigating the repercussions of child-abuse allegations or the nebulous science of environmental "risk management," Siegel's elegant, evenhanded prose delves into human dilemmas with a depth, a distance—even, dare it be said, a lack of immediacy—with which other media cannot compete. Never condescending, always superbly researched, Siegel's essays slow the pace of modern life and give it a long, hard stare." 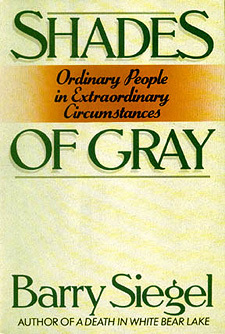 "Shades of Gray is full of life and color, and deals with very interesting people whose stories are overflowing with intellectual uncertainty. Ambiguity lies at the book's heart—that's what the title wants to get across—and Siegel deserves much credit for treating it as a fact of many people's lives. Siegel catches people not when their conflicts are resolved, or at least well-defined, but betwixt and between...This is superior journalism, dealing with what Siegel calls "continual, subterranean news," and one can only hope it's the start of a trend." "In 1979 Los Angeles Times reporter Barry Siegel persuaded his editor to give him an extraordinary assignment: As a roving national correspondent, his job would be to cover not what was happening in the news, but the whys and hows, his focus long-term rather than immediate. The pieces that make up Shades of Gray are culled from the insatiably curious Siegel's 10 years on this beat—and they are riveting. He covers matters of justice—the dilemmas of the judge determining the amount of financial reparation owed Dalkon Shield victims; matters of medicine and ethics—close-ups of the surgeons who perform life-or-death surgery on fetuses in utero; family matters—the nightmare of a couple accused of child abuse, perhaps wrongly, perhaps not; as well as matters of science and nature. In every instance details are what interest Siegel: 'They are more interesting than opinions and they thoroughly cripple ideology.'"